Spring season is upon us (or as many say “Spring has sprung!”). 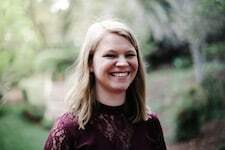 This means many of us are looking for great spring activities for kids. For us, our pre-school and tot school learning theme was planned in accordance with the season to encourage us to get outside and get exploring even more. It has been such a wonderful experience for us because surprisingly, we have a bird’s nest with babies in it right outside our door and kitchen window! The best supplies of all for spring activities are probably right outside! While we did play with flower puzzles inside and other resources, we played with sticks, leaves, dandelions, flower petals, and blooms. What better way to learn than from the source that is the Earth?! Our favorite book is Baby Loves Spring. We are a big fan of these books and also love the Where is Baby’s Belly Button? book. It has lots of flaps to discover what’s lurking behind tress and in puddles. It’s a great book to get your toddler/preschooler curious about what they might find on their own adventure outside. We have a great wheeled garden tote that my daughter absolutely loves to push and pull around the house and yard. In it we have kids gardening tools, chalk, and leaves and other toddler treasures found while exploring outside. As for books, we looked for books that reminded us about what we were seeing as the weather changed. So we found books on dandelions, beetles, flowers, and Spring itself. I have linked to some of them in the pictures below. Our favorite is the Giant Pop-Out book because it has fun pop up pictures and encourages exploration which made it exciting reading it with my toddler! 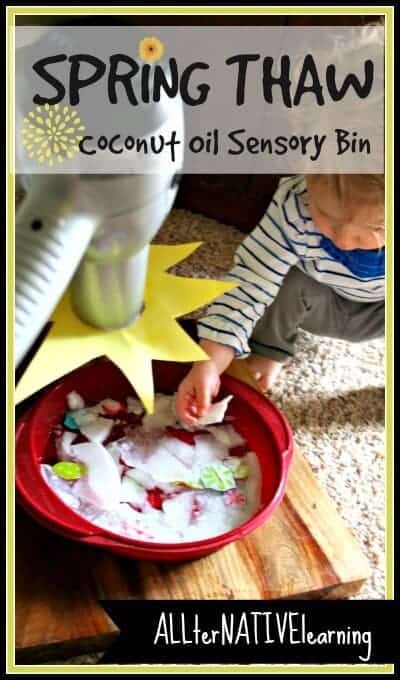 Our favorite indoor project was a Spring Thaw sensory bin using coconut oil. Be sure to check out how we did it and how we encouraged investigative, child-led play. We have played with the same bin several times while melting and re-freezing it to enjoy again and again! Spring in general is a great time to play with sensory bins. There are so many things to touch and feel from seeds to flowers petals. We don’t put together a lot of sensory bins, but we do like engaging in sensory play and exploration during free play outside. There are so many awesome arts and crafts, hiking adventures, and fabulous ideas from other bloggers. 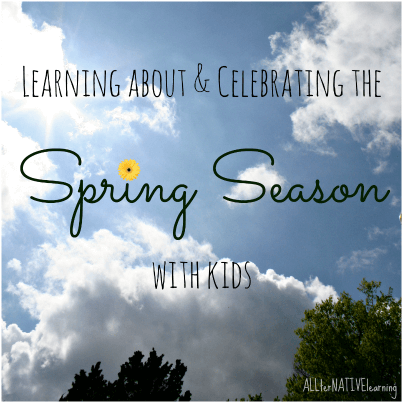 I have compiled a great list of resources for other spring activities for kids that we love! – Spring Has Sprung by Frances England is a cute little song to do an extension activity with to talk about the birds, the butterflies, and the tulips. It’s a kids’ song with a folk-tale sound and a great addition to any Spring season unit! 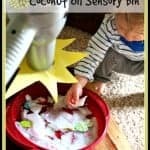 – My daughter loved playing with some old silk flower petals in a sensory bin like this idea from The Chaos and the Clutter. Review colors from week one and enjoy matching butterflies and other cut-out shapes like can be found here at Life with Moore Babies. Take your activities outside like Buggy and Buddy to make sure you celebrate the arrival of spring by getting outside to at least enjoy the passing of the winter vortex. And finally, just spend some time outside enjoying nature and being a little observant. 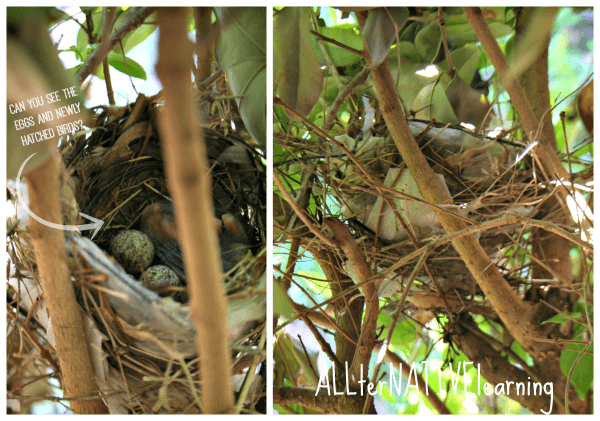 For us, that meant finding a sweet momma bird had built her nest near our front door. Her little chicks are hatching now and we are enjoying the chirps and commotion that new life brings!